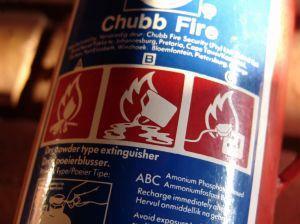 Many people wonder, what type of fire extinguisher should be in a home? Honestly that should never be the only question home owners ask when it comes to fighting fires in the home. The first rule to remember is that fire can and does injure and kill people who own extinguishers each and every year. An extinguisher is not always the answer. 16,400 individuals (not counting firefighters) were injured and 3,245 individuals died due to fire. These statistics show that fire was a bigger killer than all natural disasters combined. Only 1.6 million fires were reported, but a large chuck each year go unreported and likely cause injuries unknown. 31,000 of the above fire numbers were intentionally set by individuals and these fires caused 305 deaths. Overall 81 percent, of fire deaths occurred not in businesses but in residential settings. It's a lot to consider and shows that people really need to take fires much more seriously. All family members should talk about and discuss home evacuations routes in case of fire. Consider alternate routes to safety and what to do if you have a double level home. Families with young children should practice their evacuation plan once a month. Plan a designated meeting place in case an evacuation is necessary. A neighbor's home is a good choice. Make sure everyone - even young children know how to call 911 - after they get themselves to safety. Practice fire safety techniques such as staying low to the ground and when not to open a door during a fire. And yes, make sure you know what type of fire extinguisher should be in a home. Know how to use an extinguisher and more importantly when not to use it. Planning a fire safety plan for a home is a large and important job. To help with the planning part read Fire Safety Monitoring or even set up a tour at your local fire department. You can also access fire safety education clip art to help create a plan. The best type of fire extinguisher for a home is one that has a rating of 2A 10BC. Sometimes the rating may be written like this -- 2A 10B C -- but it's the same thing. This kind of fire extinguisher is often labeled as an A-B-C extinguisher. Sometimes these extinguishers are referred to as 'universal' extinguishers. Most fire safety programs recommend having one extinguisher located in the kitchen and one in the garage. You can see a great overview of the different extinguishers available at the Occupational Safety & Health Administration (OSHA) on fire safety. Why Use the A-B-C Extinguisher? A: Wood, paper, cloth and other basic material fires B: Oils (including paints with oil) and gasoline fires C: Electrical fires caused by small appliances, circuit breakers, wiring and other small electrical items. Aim the nozzle at the base (bottom) of the fire. Sweep the nozzle from side to side while continuing to direct it at the base of the fire. Pull, Aim, Squeeze, Sweep = PASS. Not using PASS is dangerous - aiming at the middle or top of certain fires will ignite them not fight them. A good online fire extinguisher training video can also be a great learning tool. You aren't sure it's the right extinguisher for the type of fire. You're too nervous or forget the keyword PASS. The fire is bigger than a typical trash can. The fire looks as though it could block your escape route. If the fire is simply not going out, then stop fighting. Fighting fires is not your job; if you cannot easily and quickly put out a fire than it's too dangerous to try. Get out and call the fire department. On that note, it's good to remember that even when you successfully put out a fire in your home with an extinguisher, you always need to call the fire department. Someone will come by and investigate the site of the fire and make sure you got it out correctly and that another fire is not going to ignite. To learn more about all things fire extinguisher related visit Fire Extinguishers 101 or contact your local fire department.